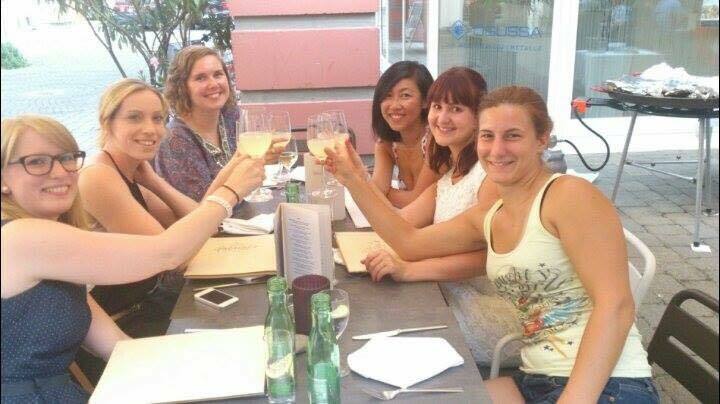 After meeting a fellow Aussie “foodie”, and being informed of Gabriel’s Cucina in Dornbirn, we decided to organise a girls night and try out this Mediterranean restaurant hidden in an alley off Marktstrasse. The night in question was stinking hot, with the temperature still over 30 degrees at the time we arrived. However once we had all cooled down after the walk there, we could appreciate the beautiful warm evening sitting at a table in the courtyard. We were also greeted extremely warmly by the host who recognised we were a group made up of a variety of nationalities and proceeded in telling us the specials in both English and German. To start the evening off we ordered a round of prosecco limoncello while we browsed the menu, which went down extremely well, and far too quickly. Unlike a lot of places I have visited here, they have gone for quality of ingredients over quantity of dishes available. They had a few starters including an antipasti plate, marinated prawns, mixed salad, or carpaccio in red wine, as well as a variety of soups including fish, mushroom and parmesan cream. Needless to say hot soups were not really what we wanted on that evening, and with the heat we all decided to just go straight to the main event. For the mains they had some delicious sounding salads, with one served with a mango-curry dressing. For all the pasta lovers out there (which is normally me) they have a good selection, from vegetarian spaghetti, ricotta ravioli, bolognese made with italian sausage, and chilli pasta with strips of beef fillet. The gnocchi with gorgonzola cheese or risotto with beef, zucchini and olives also sounded great. However, nothing off the menu got our attention like their specials. 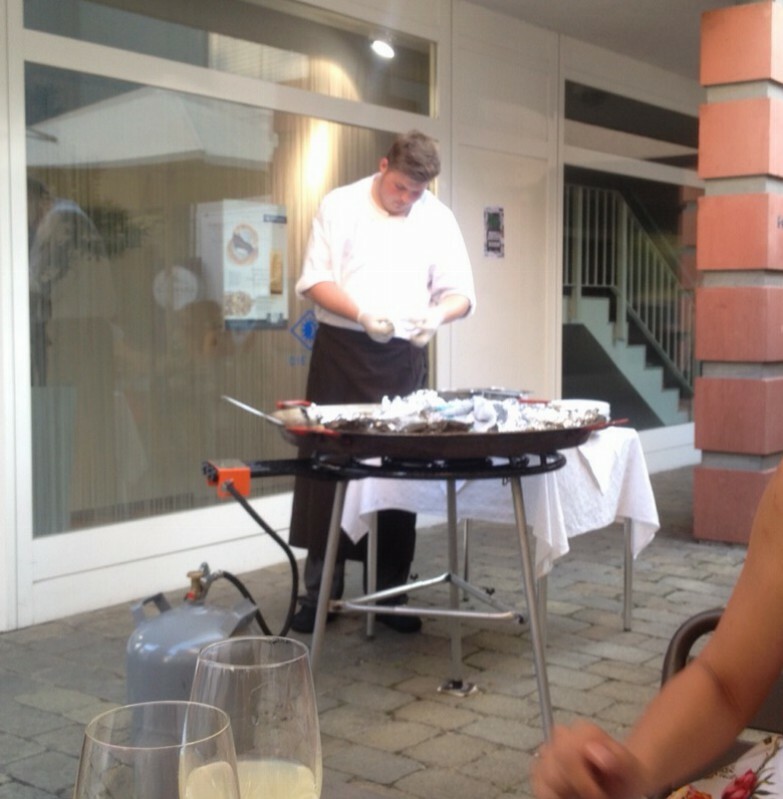 They had a choice of spaghetti vongole, zander fillet or an amazing looking paella that they had cooking out in the courtyard. The smell was enough for every single one of us to order it. So I’m afraid my review on the actual taste of the food is going to be quite limited at this point in time. As the plates of beautiful paella were placed in front of us, everyone’s phones were out taking photos. 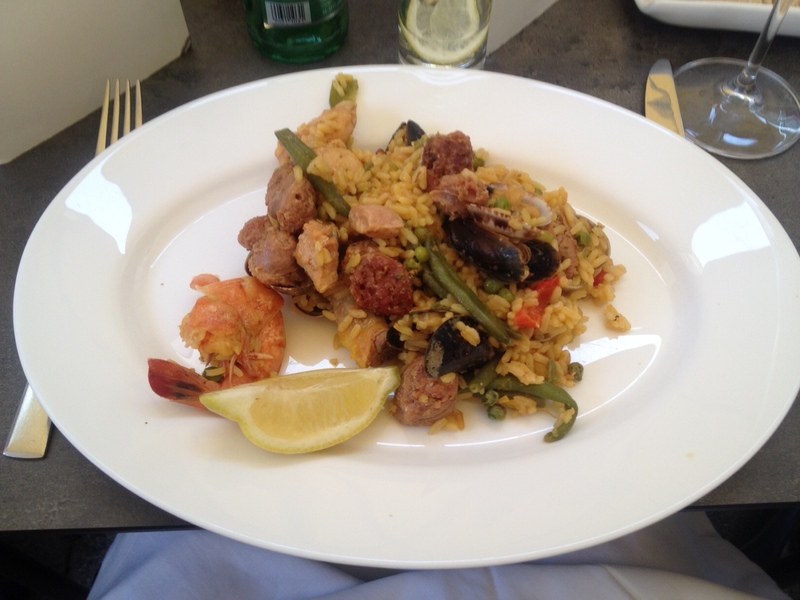 Each of us had a chicken drumstick, prawns, mussels, pork and some amazing sausage pieces mixed in. Even though each one of us was getting extremely hot again while eating, there was nothing left on anyone’s plates apart from mussel shells and chicken bones. To keep the fluids up on this hot evening we needed to stock up on drinks and so the popular weiss suess was ordered by the bucket load, and I have to say it had to be the best one Ive had since moving here, which is a testimony to the quality of wine they serve here. Whilst deciding if dessert was on the cards, our host for the evening tried to help us with that. After asking if we wanted to know the dessert selection his response was “me”. He was extremely friendly, really adding to the quality of the experience we had there, and seeing him interacting with other tables, this was not just reserved for a group of eight females. Their special of homemade cheesecake sounded great, but due to the weather it was too tempting to turn down the offer of their homemade ice cream. So with two servings and eight spoons later we all dug in. 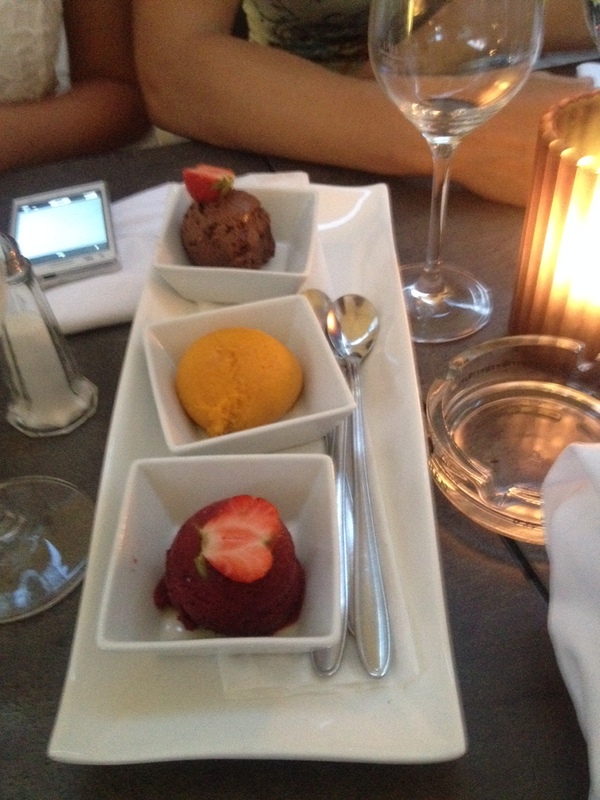 We had mango and ginger, which was so refreshing and the flavours were amazing, a passionfruit and raspberry and a chocolate ice cream, which was more like mousse, but was definitely my favourite. After even just sampling the few dishes that we did we were all in agreement that we had to return here to try out more of the menu, and when we met up with people later that night, one of the first things that was said was how good dinner was, which really sums up our evening. So if your looking for an enjoyable evening with delicious food, great wine and fantastic service, look no further, and you will probably see me there sampling more of their menu.